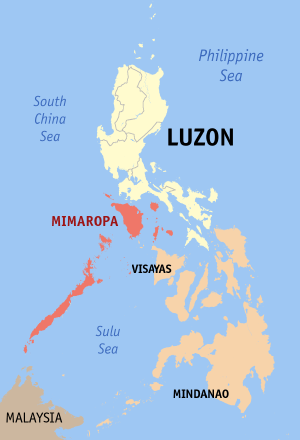 Mimaropa (from Mindoro, Marinduque, Romblon and Palawan) is Region IV-B in the administrative system of the Philippines; as of the 2010 census it had a population of 2,750,000. Tourism, fishing and manufacturing all play roles in the economy, but agriculture is still the largest contributor at 42% of GDP. The national government divides the country into three major regions — Luzon, Visayas and Mindanao — and includes Mimaropa as part of the Luzon group. In 2005 an executive order was issued to reclassify Palawan as part of the Western Visayas region and rename the remainder of Mimaropa to Mimaro. However, this was put on hold and, as of 2015, it is not clear if it will ever be implemented. Wikivoyage divides the country a bit differently, treating Palawan as a separate fourth region. We include the other provinces of Mimaropa under Luzon.